Clybourne Park is a title that would not be out of place on a bookshelf of Gothic novels. The play itself has a lot of Gothic elements and the setting is gloomy. There is a fallen hero in the story and the characters are dealing with doubt, tragedy, and transition. All of these features add atmosphere and tension to this satire about race and real estate. I went into Vanguard University’s production of Kiss Me, Kate being very familiar with Shakespeare’s The Taming of the Shrew but knowing very little about Kiss Me, Kate, except it had some Shakespeare in it. Now some of the Bard’s works have aged very well. Even if you don’t agree with them, a lot of his characters are sympathetic, and their motivations are not as dated as one might think–most high schoolers can see themselves in the classic lovers Romeo and Juliet, even if the pair are now typically viewed as some of the least intelligent characters in works of fiction. The Taming of the Shrew is not one of those plays. Our ideas and opinions regarding the treatment of women have shifted enough that the viewer/reader recognizes how tasteless and ludicrous the treatment of women in days past was and any laughter stems from that recognition. The play within a play Kiss Me, Kate provides a backbone for Shakespeare’s story, allowing us to laugh more easily at the show, and it is played well by Vanguard University’s sprightly cast. We see the traveling cast of The Taming of the Shrew is preparing for another opening. 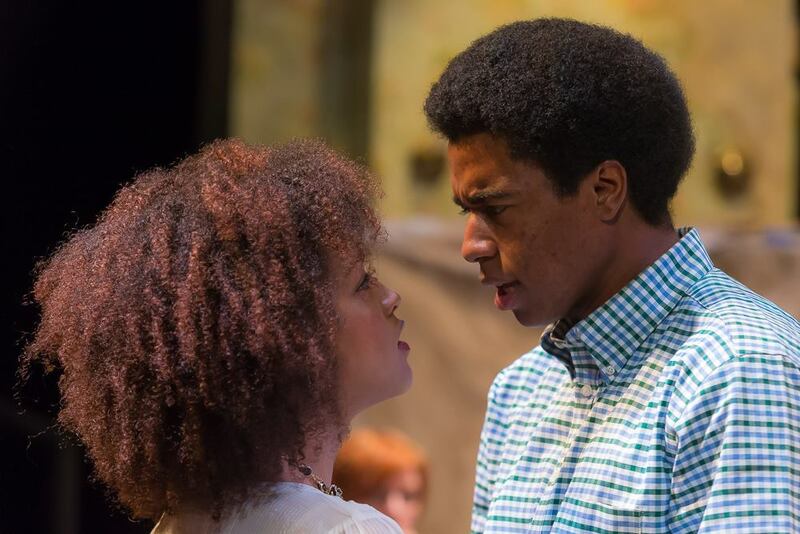 The lead actors in the play, Lilli Vanessi and Fred Graham play the characters Katherine and Petruchio. This former wife and husband –like their characters in the play –are not getting along. She’s something of a snob. He’s…also something of a snob, so they are pretty much made for each other. Another couple –Lois and Bill, who have the roles of Bianca and Lucentio in the show –are also having some (though not to the same extreme) problems. Bill signed an IOU to the mob in Fred’s name, and Bianca is a little too flirtatious. A pair of gangsters arrive on the scene to collect money from Fred and insist on being a part of the play in order to keep a better eye on him. Insert song and dance numbers as required. The set was nicely put together. They have a rotating stage, which enables the audience to see the ‘behind-the-scenes’ action and better envision the chaos when it is not happening directly in front of you. The costumes are bright and colorful. The props are sufficient. This is not a dark show in any way, so the brightness and pep coming with a set such as this is perfectly suitable, and the cheery band manages to beautifully play every note without overpowering the singers. Across the board the acting is pretty solid. Every now and again an ensemble member stares off into space, but for the most part the actors are engaged in the moment. Special mention goes to ensemble member Winter Bassett. She is captivating. Her quirky, perky energy is infectious, and there are times when you’ll have to work to take your eyes off her. Kelsi Coleman is also a commanding figure and undeniably worthy of her role as Lilli Vanessi/Katherine. She is snide, cold, aggressive, warm, and doting in all the right ways. She simply wears the character of Lilli Vanessi very well. I also would not be able to sleep tonight if I did not mention Mark Austin Nunn, who plays one of the goofy gangsters fabulously. He is extravagant and ridiculous without crossing the line into sheer stupidity. In other words, he does it without looking like he is trying too hard. He grimaces, gambols, and blusters, but he does it with such simple sincerity that for the most part one can’t help but grin when he is around. This thug is clearly an unintelligent fellow, but Nunn manages to play the character without some of the drunkenness that could easily have accompanied this part. The weakness of the performance is the vocals. The lead performers are mostly fine, but the ensemble’s singing gets shaky and out of tune from time to time. Fortunately, I do not have to say the same thing about the dancing. The choreography is good, and the actors know it well. The actual songs can be fun, but some of them are too long and don’t have an actual point, which leads to boredom no matter how well the dance numbers are put together. I cite “Too Darn Hot” as a reference. This song is pure filler and has absolutely nothing to do with anything. There are several numbers like this, and they are a drag. Meanwhile, the songs moving the plot along are delightful. Plot Hole – Lois and Bill are presented as relevant people in the story, and then they are casually brushed aside as the ending nears. The useless songs and underdeveloped story issues ultimately prevents this musical from actually being or saying anything relevant. That being said, the occurrences backstage do provide a backbone, and although that backbone sometimes seems feeble and weak, it is strong enough to support the beauty of their fully fleshed out production of The Taming of the Shrew. Side note : Spoke to soon, you can throw this show on the list of best shows of the month.